Cesar is originally from the Dominican Republic and has lived in Florida for 18 years. He has spent much of his career in real estate and sales. His passion for helping others throughout the homebuying process is what keeps him moving foward. With over 7 years of previous experience in real estate, Cesar realizes the importance of communication and transparency. He relies on his experience to help his clients achieve the dream of homeownership. 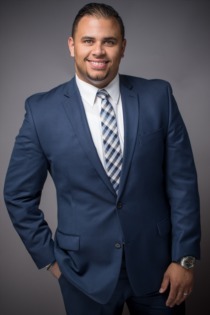 Cesar knows and understands that each of his clients are different, and he works hard to help identify their immediate and long term financial goals. He relies on this knowledge and his strong attention to detail to help find the best home for his clients. Cesar strives to provide a seamless process that is driven by strong customer service to all of his clients. Outside of work, Cesar keeps busy by spending time with his family which includes his 3 kids. Together they enjoy traveling and exploring new places. They also love going to the beach frequently thanks to the beautiful Florida weather.